A comment I read today on the richarddawkins.com website reminded me of a long-ago incident I thought I’d share with you. While we were living in Gainesville, FL, Pat and I attended a United Methodist Church there. Pat was a “social Christian” at the time…in it more to meet folks and enjoy the picnics than anything else, and I was a “closet atheist”…you know, the go along to get along type. I had allowed Pat to convince me that it would be good to “expose” John Michael, our son, to religion so he might be better prepared to make his own decisions on the subject when he was “old enough”. During this period never once did I express my doubts in front of John. One sunny Sunday during the summer just before he turned eight, as was our practice Pat and I dropped John off at the church’s “Sunday School” next to the sanctuary so he could “learn” with kids his own age while we attended services. After the service we walked next door to pick him up, only to be pulled aside by one of his “teachers”. “John isn’t cooperating,” she reported. “Well, he seems disinterested, and won’t participate in our activities or answer questions,” she summarized. Embarrassed that my son was more willing to express his true feelings than I had been, I resolved we would never return to church again. 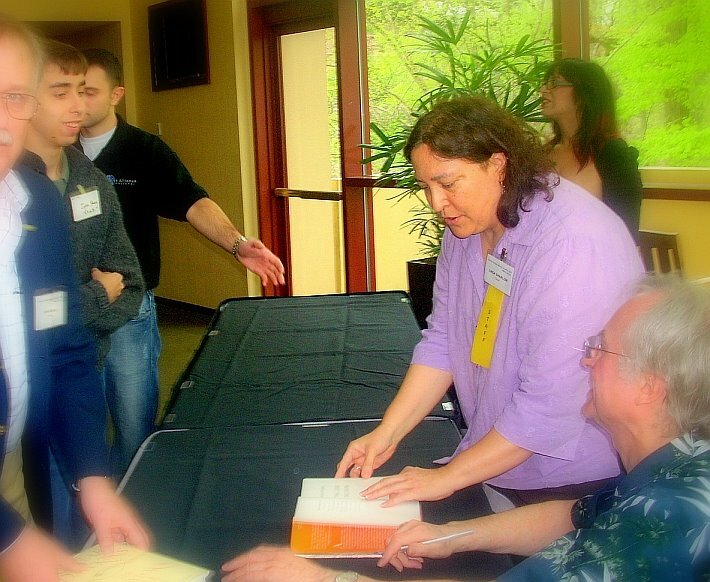 John Michael is seventeen now, and maybe the happiest I’ve seen him in a while was last weekend as he handed his copy of “The God Delusion” to Richard Dawkins for his autograph, and Dawkins glanced up at him and smiled back…undoubtedly pleased with his young fan. Dawkins firmly believes that the indoctrination of young children into religion at vulnerable ages is tantamount to child abuse. At least for this one time, I could sense him thinking, the tantamount had been slain.